Home » Elections » Write-in for Governor? Posted on Jul 23, 2018 in Elections | Comments Off on Write-in for Governor? 1. Because this is a run-off, there is no option for a write-in candidate on the July run-off ballot😟. If you do choose to vote in the July run-off, you must vote for the same political party (Republican, Democrat, Libertarian or other) that you voted for in the primary. The voting process will not let you cross party lines in a run-off. 2. The next opportunity for a write-in candidate is in the November 2018 election and then only if there is a qualified candidate. 3. You can’t just write in any name on the ballot. Even in the November election, if you write in the name of someone who has not qualified to be on the ballot (yourself, for instance) the vote will not be counted at all. 4. Anyone seeking to be a write-in candidate in the November election must qualify through the Secretary of State’s Office (by early September) like any other candidate, including paying the filing fee (or submitting a pauper’s affidavit). Because the candidates end up writing the laws, they made a rule that if you lost in the primary you can’t go back and qualify as a write in for November. So that rules out Hunter Hill, Clay Tippins, Michael Williams or anybody else who ran for the Governor’s seat on the May Ballot. What if you want your name to actually appear on the ballot instead of being a write-in? The primary is just to select the representative from each party who will be on the ballot in November and you have missed your chance to run under a party. If you want to run as an independent you can’t have qualified for the same office under any political party and you must have filed and paid the fee at the end of June, so you have missed your chance to run as an independent. Also the legislature has made it difficult to get your name on the ballot – if you don’t run with a party you have to collect signatures equal to 1 percent of the total registered voters eligible to vote in the last election for the same office. There was an attempt to make this a little easier by saying it was a percent of the people who actually voted, but lawmakers want as little competition as possible so that died a quick death. You also have only 180 days to collect all those signatures. Unfortunately at this point it is impossible for a write-in candidate to come even close to winning in November. They would need hundreds of millions of dollars to flood the entire state with signs, radio and television ads. They would also need the political backing by somebody who had the respect of people state-wide and was able to bring in the votes, along with a plane at their disposal to get from one part of the state to another over a really short period of time. If they haven’t started already it is probably too late. 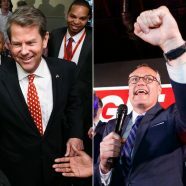 In other words, the next governor of Georgia will have a last name of Cagle, Kemp or Abrams.